The past couple of months, I've felt the need to watch and read Australian stories. I've downloaded episodes of Redfern Now, Puberty Blues, Underbelly and The Time of Our Lives. Being away from Australian shores makes me appreciate how important it is to tell Australian stories in our own way, in our accents with our quirks. Sure we may cringe at 'Get us a chiko roll, ya moll! ', but it's a little part of who we are and it's important to take a look in the mirror now and then, appreciate the good and hopefully move up and on from the bad. As the family set off to work and school yesterday, my Facebook page filled up with Australia Day celebrations a world away. 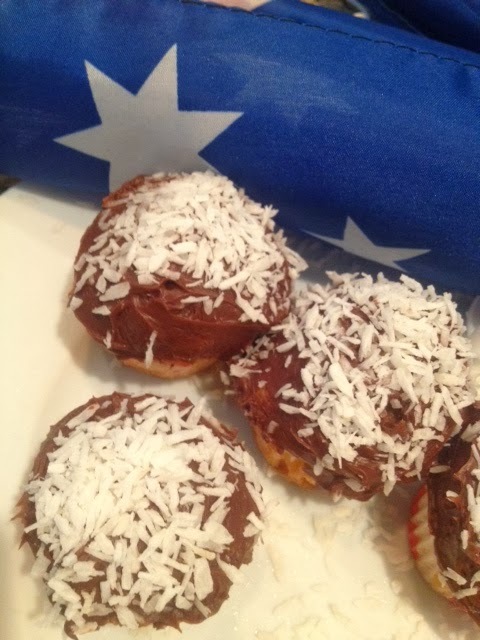 The girls tied back their hair with a kangaroo and koala clip, the boy wore his 'Australia' t-shirt, I made lamington cupcakes as an after dinner surprise. People greeted us with "Happy Australia Day!" like it was our birthday. We'd already had our own Australia Day celebration on Friday evening. We were invited to an Aussie friends home for a lamb roast and Skip made some Anzac bikkies to take along (although they didn't quite make it there). It was a sensational lamb roast stuffed with garlic and chilis, a multicultural nod from our Fijian Indian Australian host. We shared it with Malaysians, a Russian, a Swiss and an Indian person (it then turned into a double Australia Day/Indian Republic Day as they share the same date). Once again, I looked around as we all shared food and stories and felt so grateful to be in this position. I loved hearing about growing up in Soviet Russia or how speaking three languages fluently in just normal everyday life in Basel. I was fascinated hearing about being a Muslim and living in New Zealand, Australia and the UAE in a few short years and the difference (and similarities) between life in Mumbai and Dubai. In a strange way it felt like the best way to celebrate Australia Day. And as with any celebration talk kept coming back to sport and food - the passions the world over. So as Aussies, I believe, we need to keep telling our own stories and making sure we listen with genuine curiosity to other people's too. It's the only way we're going to evolve and be the best country we can. 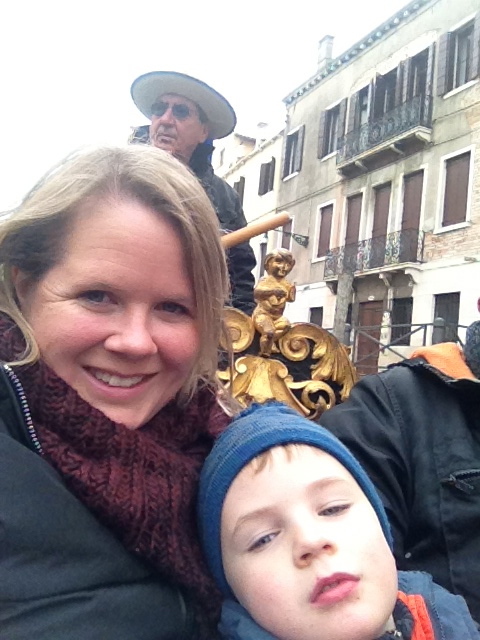 Being a parent to three kids can be all-consuming and exhausting. Scrap that. Being a parent to any number of kids can be all-consuming and exhausting. Some days, or rather most days, can feel like your just doing what you can to get to bed-time - feed them, cloth them, get them to run around a bit, perhaps teach them something, answer a lot of questions, say no a lot. Rinse and repeat the following day. Groundhog day. Recently I've been a cranky, shouty mum which I don't really like. The kids have been driving me crackers and I react and it's not fun for anyone. I don't know whether it's them or me, but the past week has been a lot better. I've engaged with them more, appreciated them more, listened to them more. Set aside time with them rather than worrying about the dinner/shopping/tidying/etc/etc/etc. Maybe it's as simple as the elder two being at school and having five minutes to myself. I wish we could have this household all the time. Many people here have live-in maids/nannies (many people also don't) and believe me it's something we think about doing. Imagine just doing all the nice stuff and not worrying about the washing, the bed making, the sweeping? Also, the freedom to pop out to the hairdressers or even a doctor's appointment without a two-year-old in tow. Or go for dinner or a movie with my husband on the spur of the moment? All sounds good, but it's not as easy as that and I won't bore you with all the negative issues that have so far prevented us from hiring someone. Lil-lil losing her top front teeth and having that classic gap. Also, the fact that she has finally 'got' reading on her own. The past few days I've found her curled up with a book - so good! Goosey's dancing, she has rythymn most could dream of and a style all her own. Plus her one liners and observations of the world never fail to surprise me. Darbs little mind opening up! He's talking, knows his colours, can't count to 20 and spot a Ferrari or Lamborghini before anyone else. We are well and truly into 2014 now. No going back now, holidays (for us) are over, it's back to the grind/routine/real life. So far, it' been a wet and chilly one in Dubai. Everyone we meet has said they've never felt this cold before here and are breaking out jumpers and jeans. Still, it's been 21 during the days and 18 overnight, so it's not like it's a polar vortex or anything. It actually could be a January day in Hobart! But for us Dubaiins it's chilly and I, for one, am making the most of it because one thing is certain - it won't last. Eating fabulous Afghan food with friends while the kids played in the shadow of the world's tallest building. Not a bad way to celebrate an 8th birthday! Pretending that it's really and truly winter and cooking hearty meals. As well as eating scones. Discovering a new favourite place to eat (The Iranian Club), we'll back there for sure! Meeting up with friends after the winter break as they've returned from their 'home' countries. Feeling comfortable that this is 'home', don't feel like the newbie so much anymore. Making plans for the year ahead and looking forward to it. It's always exciting to map out how you hope the year will go, even better when there are wonderful surprises along the way. Having hysterical conversations with Darbs, it feels like he's grown a year in the past couple of months. Generally feeling content that our family of five is doing well together and separately. We're all kicking goals in our individual lives and enjoying each other's company when we come together. What have you enjoyed about 2014 so far? The toughest part about living abroad is the making friends and finding a social life. Entering a new community, sucking up the courage to put your shyness/insecurities aside and saying 'hello' to that stranger or calling someone you've never met and asking them out for coffee is just a small but uncomfortable part of that. I guess it's kind of like dating, but you're looking for "the ones" rather than the one. When you live in a fairly transient place like Dubai, it means having to do this over and over again. People move on or go home and your social circle can suddenly be depleted before you know it. Just when you're getting comfortable, it's time to put yourself out there yet again. It's good for me to be pushed to put myself out there, as I won't do it if I don't have to. The thing is, when you don't put yourself out there you can miss out on some really amazing experiences. Recently we've had to say goodbye to a number of people and while it would be nice to cocoon ourselves up as a family of five, it's much healthier to get out there and build up the social circle again. So, 'how do you that?' I hear you ask. Well, I've been online seeking out playgroups and coffee mornings and social groups and while the normal-at-home-in-Sydney me would throw up a little in her mouth at the thought of this, it's how you meet people. So far I've stayed away from the Australian groups, because, well if I wanted to hang out with a bunch of Aussies I would have stayed in Sydney, but I think it may be time to start looking in that direction too. As looking through the groups online I realised that I don't really have a hobby that I can utilise - so the crafters, the soccer players, the quilters, the triathletes, the long distance runners, are not high up on the list of groups I'm going to sign up to. Another way to meet people is to essentially force yourself upon the fresh blood. Someone new arrives in town and their husband works with your husband, so you give them a call. It's awkward as hell, but it works. In fact, just before typing this I forced myself to pick up the phone and call a complete stranger. I have to say, I'm glad I did it, as she was lovely, we ended up having a good conversation and I'm really looking forward to meeting her in the flesh. She has similar interests to me, but she's grown up in a totally different world and is someone I would probably never meet living in suburban Sydney. The thing for me, it's not about finding like-minded people. Sure, that can be nice, but travelling and putting yourself out of your comfort zone means meeting people who have completely different ideas about the world and that's what I love. Talking to people whose life experiences have been completely different to mine. That's what I want to make the most of. Also, what may seem like a perfect match on paper may end up being a dud in reality. Unlikely friendships can sometimes be the best. One of the best times I've had here is sitting round with a group of mums from around the world - UAE, Portugal, Lebanon, Egypt, Ireland, Netherlands, France, Brazil - the only thing in common is our kids are in the same class. Listening to these women discuss their lives and comparing notes has been fascinating. Getting insights and feeling secure to ask "Why do you do….?". It's fascinating for someone like me who's interested in people and what they do. So wish me luck as I put myself out there yet again. I'm looking forward to a year filled with lots of conversations with interesting people. Here's hoping!